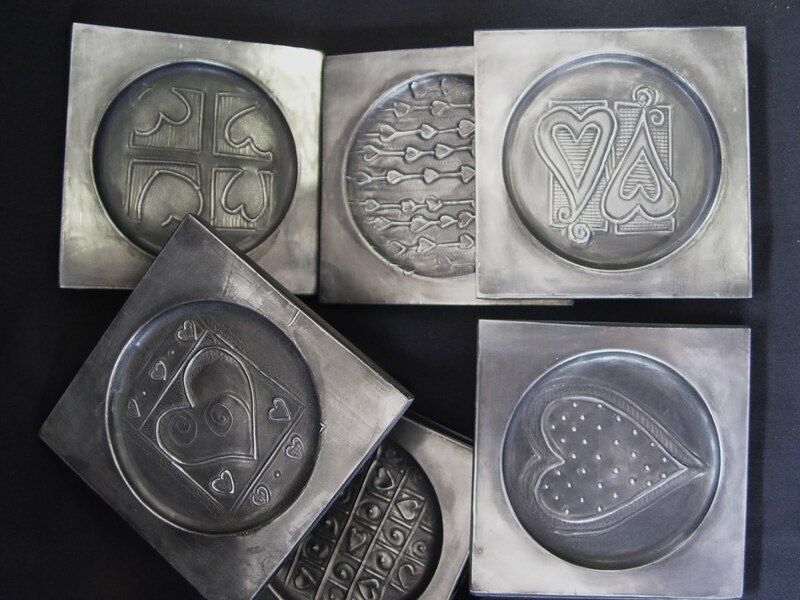 A book with a beautiful personalised pewter cover has to be one of the most special gifts. We spend many hours in the studio designing book covers for clients. 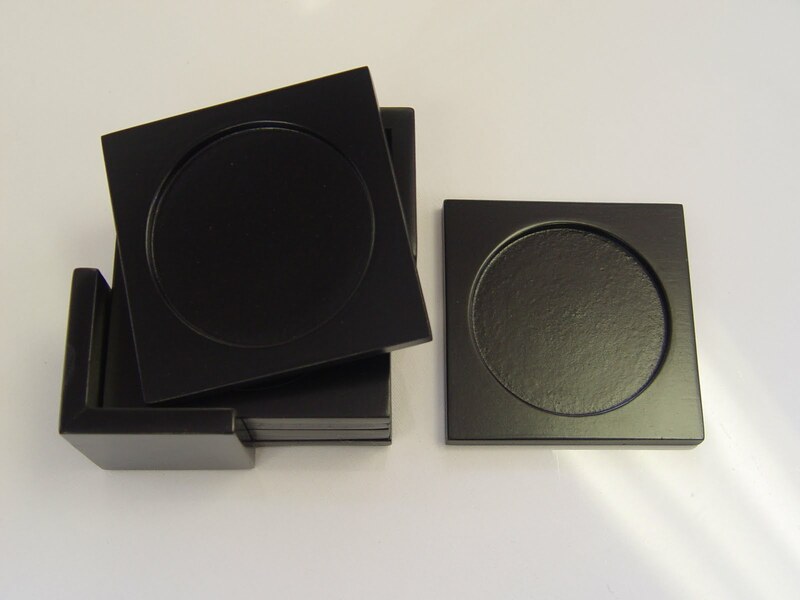 Here are a few examples of bookcovers we have created in the studio. My recipe book! I love this book, filled with my entire life as well as recipes of course! It is a huge thick leatherbound precious book. The right hand pages are filled with my glorious tried and tested recipes, (I am an avid cook and love food, food and food.) The left hand pages are filled with my written life, almost like a journal but more random info, facts, stories and bits of painting, sketching and design work. 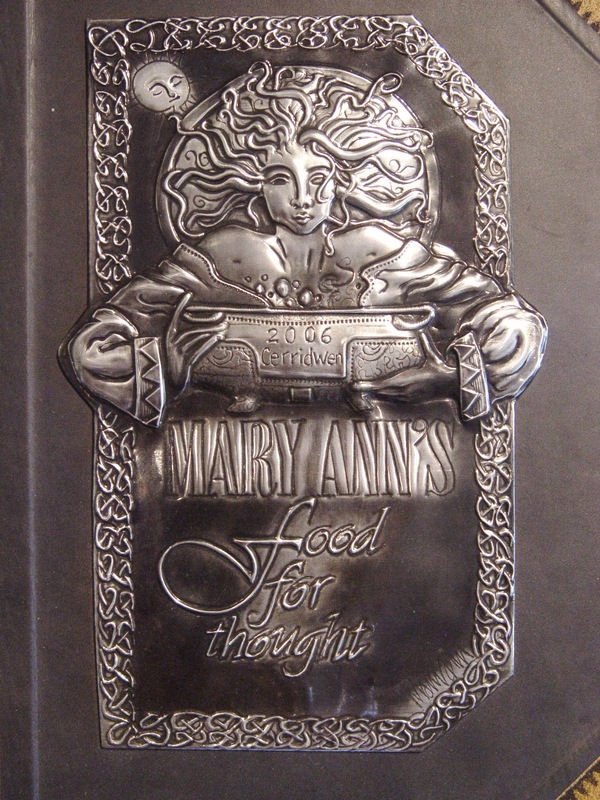 The cover is a pewter interpretation of Cerridwen the welsh goddess of Inspiration and creativity. She brewed a broth for one year and a day which produces three drops of inspiration. 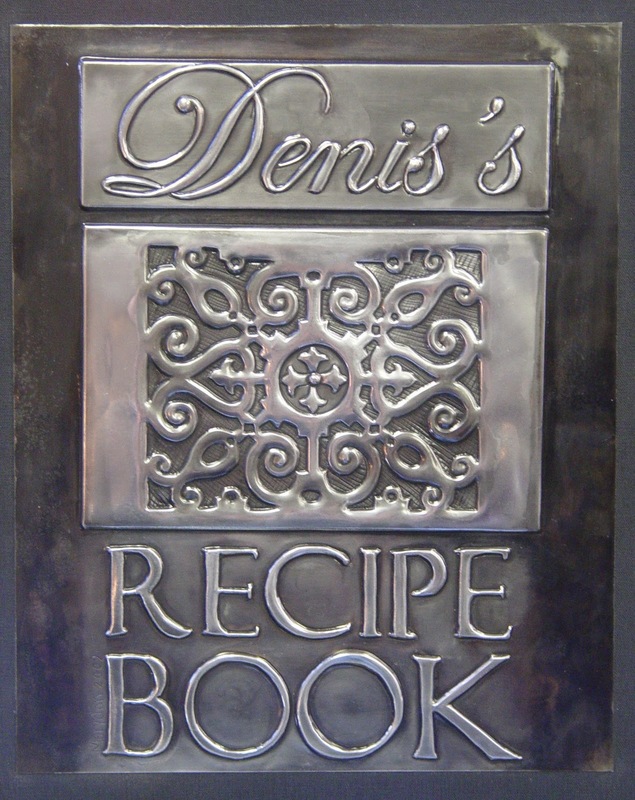 Simone’s dad’s recipe book, the overall layout and design just worked so nicely. I did a series of these lovely little notebooks some time back. 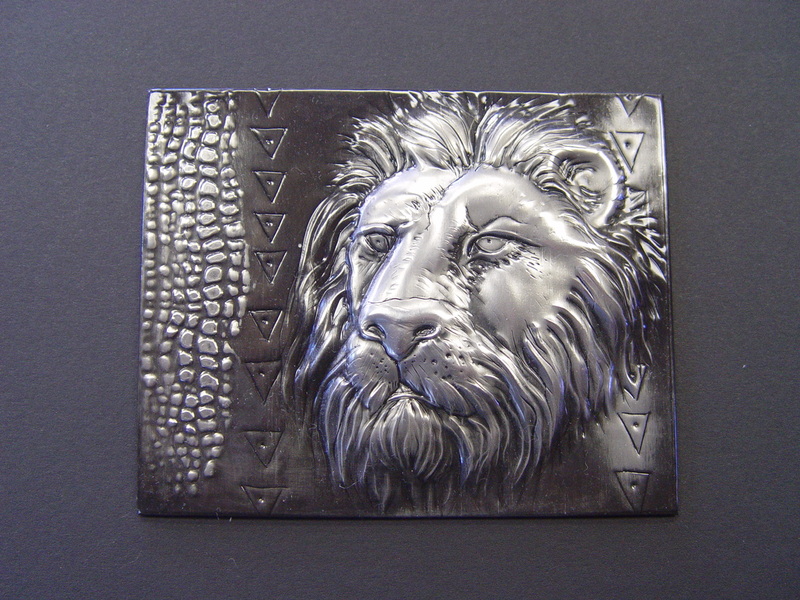 The blocked design was done seperately and then backed with firm board, edges folded over and then glued onto the pewter cover of the book. 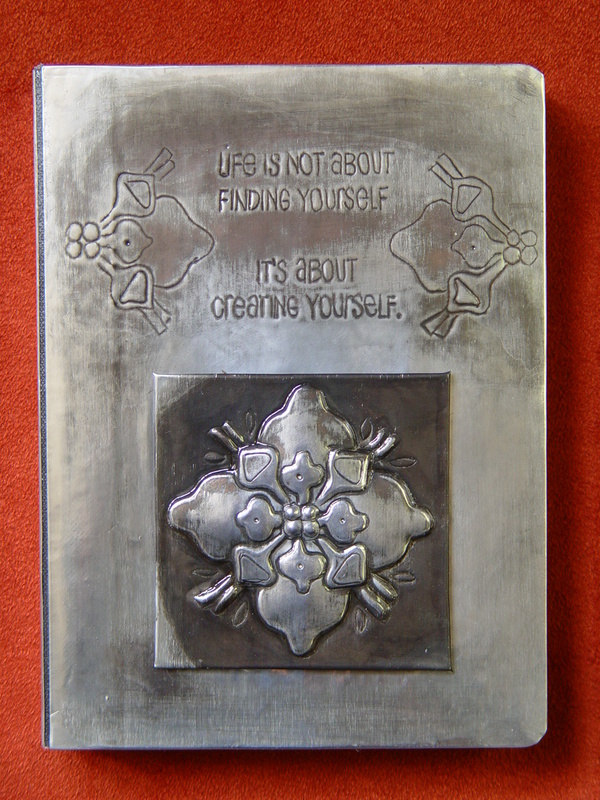 The wording was engraved into the pewter as well as the fine lined designs on either side of the wording. I tried to grab an hour of quiet time after a hectic day with the intentions of working on a little pewter face in front of TV. My work surface is a cushioned melamine TV tray, the left half is my hard surface and the right half my soft (felt) surface. 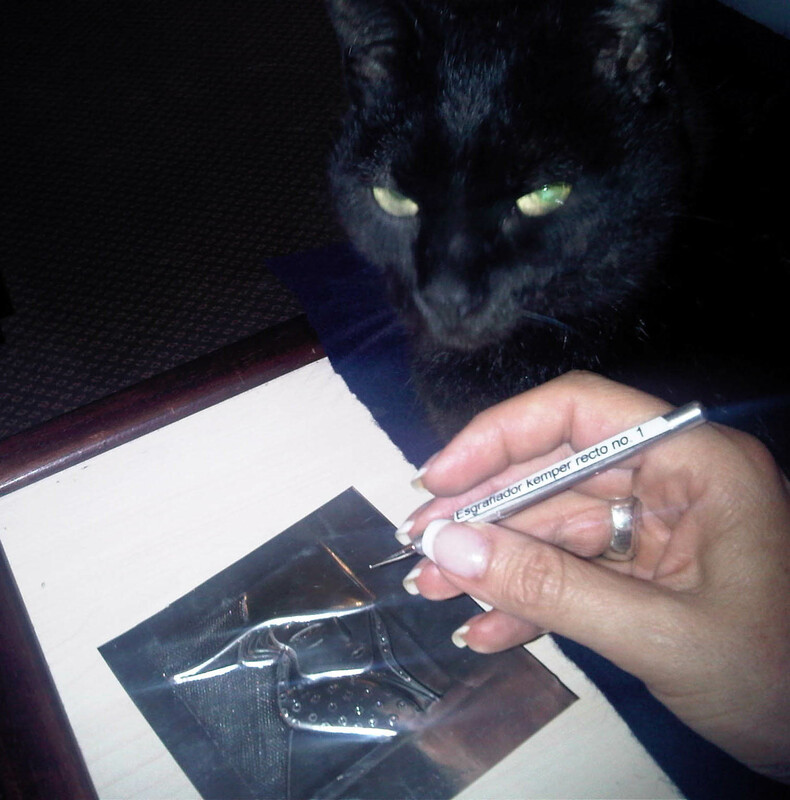 I had just gathered myself and picked up the first tool to start working when Bizkit the cat quietly climbed up onto the tray. She pawed each tool in turn until all the tools where on the floor besides the one in my hand. She then curled up on the piece of felt and started purring with delight at her comfortable space. 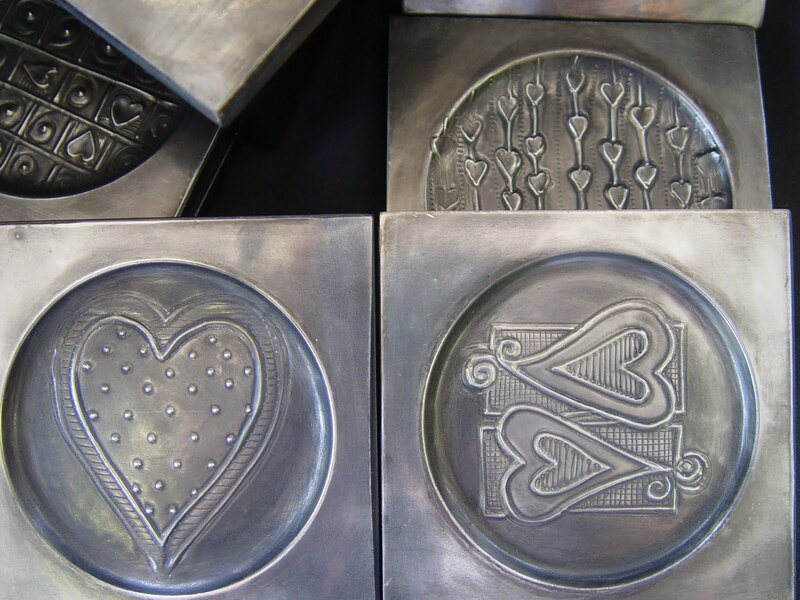 I worked for 10 minutes using Bizkit’s back as the soft surface to stretch my pewter and then neatened from the front on the melamine hard surface. The work deteriorated at a rapid rate and I gave up, not before I took the pic with my phone!